Over the past two years, the last weekend of September in North Texas has been the site of the world’s one and only convention for instant film photographers and artists, PolaCon. This second year event has organically grown from humble beginnings, rooted in the old fashion social meeting place for photographers, the photowalk. Back in 2012, two Dallas photographers, Justin Goode and Daniel Rodrigue met up over their mutual love of and public advocation of instant film photography. That meeting resulted in the formation of a group named the Instant Film Society, a group dedicated to bringing all those who love shooting instant film together, as well as spreading awareness of instant film to photographers of other media, and to the public at large. IFS held its inaugural pola-walk at the State Fair of Texas that year, and based upon its success, the group began hosting a pola-walk each month. Each walk drew more and more photographers as word of mouth and social media spread. Photographers from around Texas, as well as those from out of state began to attend. One of those out of state photographers, Toby Hancock from Los Angeles pressed the North Texas IFS members about planning more events and walks for the out of towners. An off hand joke by Rodrigue of hosting a “PolaCon” was exactly the type of event Hancock was talking about, and he kept inquiring about it until Rodrigue and Goode found a way to make it a reality. PolaCon is a completely free to attend 3 day convention with more than 25 workshops and 7 pola-walks happening at four primary locations. The Instant Film Society has succeeded in pulling off this event over the past two years with an operating budget of zero; with nothing spent on advertising or promotion, no marketing. The first PolaCon in 2016 drew 125 attendees; 2017 drew almost double the attendance, with between 230-240 attendees. 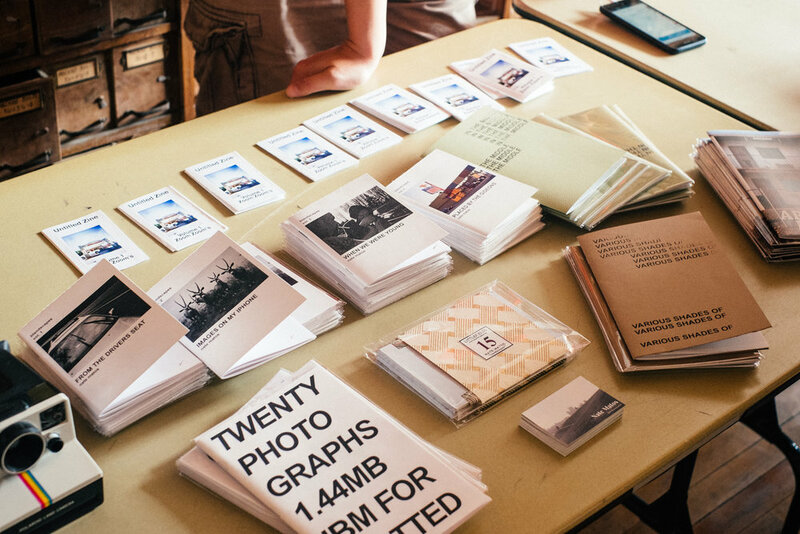 The convention has kicked off each year similar to how the Instant Film Society held their first event, with a Pola-walk at the State Fair of Texas. Although this is considered to be the event to start the convention’s weekend, there are plenty of other walks and meet ups happening split between the cities of Dallas and Denton during day one, before the con moves to historic downtown Denton for Saturday and Sunday’s festivities. If you’re the type of photographer who loves participating in scavenger hunts, the convention’s weekend features two! A special one based on the experience of spending a fall day at the State Fair of Texas, and a general one that runs through the weekend, with some very awesome prizes (such as Fuji Pack and Impossible / Polaroid Originals film, a copy of Pearl Jam’s Mike McCready’s instant film book, “Of Potato Heads and Polaroids”, and an Impossible I-1 camera!). I was told that if you are unable to attend the whole weekend, that Day 2 is the day that you want to set aside time for, as most of the workshop / demonstrations happen that day. The day starts with a casual breakfast meetup, and a early morning pola-walk around Downtown Denton’s historic town square . After the morning pola-walk, the remaining day 2 events required an RSVP for attendance. Dallas photographers Steven and Erin Reeves held a pack film 101 workshop detailing the many camera options available to shoot Fuji pack film. Steven also setup a photobooth and shot portraits of attendees using Andy Warhol’s favorite Polaroid Camera, the Big Shot, and also gave a demonstration on methods for scanning various Polaroid formats for enlarging and printmaking. Anne Holland presented a photo journaling how-to session for those interested in using their instant film photographs to make personal crafted photo notebooks and journals. Jana Uyeda gave a demonstration on triptychs she shoots using Instax Mini film. Andy Odom, an IFS member and an early adopter of the Impossible I-1 camera demoed the camera’s ins-and-outs and to best utilize it for creative shooting. After the swap concluded, one of the day’s most popular presentations was given by IFS’s Brian Garbrecht demonstrating the art of wet plate photography. Attendees were then able to sign up to have Garbrecht shoot their portraits on either 8x10 for $30 or 4x5 for $15. With the growing interest in wet-plate over the past couple of years, this could be its own workshop in my opinion, as there were several photographers who were not only interested in having their portraits made, but were interested in asking Garbrecht more details about the process itself. Armand Kohandani of Denton Camera Exchange and IFS Co-founder Justin Goode were also shooting portraits using Impossible’s 8x10 color instant film for $20 each. This is an incredibly unique product to have in 2017, and I do hope that Polaroid Originals continues to produce it, I was just blown away seeing some of the portraits coming through via IFS’s instagram feed. I only shoot 4x5 right now for large format, and I would love at some point to give this film a go myself! IFS member Troy Bradford gave a walk through on shooting New55 as well as using Fuji 3000b developer pods to shoot expired 4x5 Polaroid film, and Co-Host of The Instant Photo Show Podcast Jessica Reinhardt led a workshop / pola-walk on how to utilize natural light most effectively for portraits. Following a dinner break, the last pola-walk of the day was focused on twilight / dusk and neon photography led by Toby Hancock. Personally, as a fan of his nighttime photography around Los Angeles, it was a pleasure watching him work his magic in person, and I picked up some tips on shooting instant film at night so I can incorporate it into my own night-work. Day 3 featured more workshops and demonstrations hosted by Denton Camera Exchange. The convention then moved to the Patterson-Appleton Arts Center for a Pop-up exhibition featuring images entered from the scavenger hunts. There was a panel discussion featuring several expert instant film photographers discussing films, cameras and techniques, announcements for future polawalks, as well as plans for PolaCon 2018. Winners of the scavenger hunts were announced and a wrap party with live music closed out the weekend. Regretfully, I was only able to attend Day 2 of the festivities, but based on that one day alone, I am already clearing my weekend for 2018. I can’t wait to see what IFS has planned for next year!